Pets & Lawn Pesticides – How Pets are Prone to Chemical Toxicity? People use lot of lawn products to bloom those different colors and lay out a carpet of green making everything soothing and pleasant around the house. Lawn is the inevitable part and beauty of every house and definitely every homeowner loves to make it the best place on this earth. However, in maintaining these lawns by using pesticides, we sometimes forget about its effects on our four-legged companions. Lawn products contain chemicals which are extremely harmful to cats and dogs. If you are unknown to this fact, then let here unearth some of the real things about lawn products and their effects on your furry pals. Normally, pesticides used in lawn have long term activity effectiveness. They are specially designed to remain effective for longer periods. Moreover, numerous chemicals can remain active for prolonged period, we can say even months or a year. Here comes the danger when the pets along with their owners are allowed to enter these previously treated lawns unacquainted with the tarriance toxicities. Another factor is chemical disposition. As chemicals are used, some of the amount is drifted by the wind or water to other places. Hence, polluting the other areas too. Wind carries the pesticides from the treated lawns to 50 feet away. Most industry personnel are unaware of industry standards regarding chemicals and wind speed relation and moreover, do not follow the proper guidelines and precautions pertaining to this. People who are using lawn pesticides can unintentionally cause harm to their neighboring areas. And, unknowingly pets are in the danger of inhaling these toxic chemicals as they pass through. Numerous reasons exist that pets are prone to the increased risk of exposure to the lawn chemicals. As humans, animals do not wear any protective layer such as clothes and shoes. So, they are more prone to the CHEMICALS danger as the skin and feet are exposed. Furthermore, they not only walk around, but also play around into the mud digging, rolling and spending time laying down. This increases the tenacity to inhale and absorb the toxins. Outside on the lawn, the cats and dogs can also nibble onto the grass, which no doubt brings in more risk of pesticide ingestion. After playing in the ground, the pets bring in the residues attached to the coat inside the house. These toxins fall onto the carpet and beds, where they reside. Lawn pesticides, chemically active can quickly react with water and sunlight, making it stable inside for longer period of time. Due to the add up, indoor concentrations of pesticides can be more compared to the outdoor concentrations. Studies have not been evaluated about the long term effects of chemicals, but definitely there has been results shown about the development of bladder cancer and malignant lymphoma in dogs. The instant effects of these toxins include itchiness, skin rashes or inflammation, vomiting, diarrhea, dilated pupils, respiration difficulty, lack of coordination, excessive salivation or lack of coordination. The long term effects can be seen in pets by the presence of residue concentrations in urine and the higher incidence of certain health issues such as cancer. 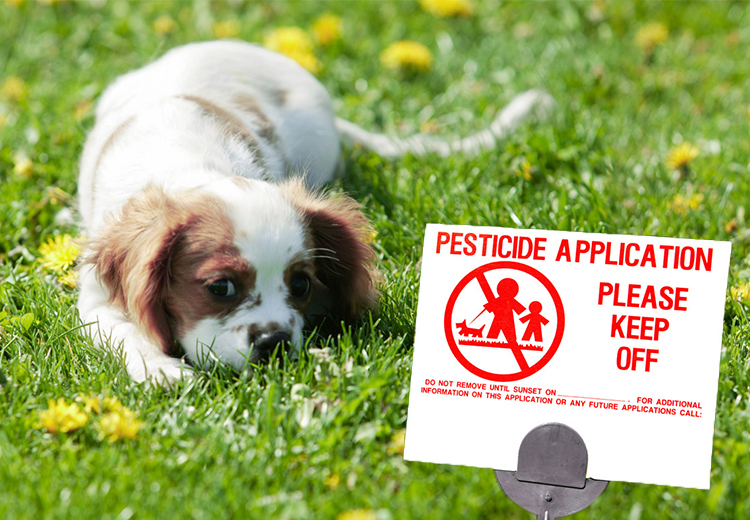 Pet parents need to be always on the verge to keep their pets less exposed to the lawn pesticides. If possible, turn to organic products in treating your lawns and wipe out animal coats and paw pads after being outdoors. This will not only wad off chemical residues but also harmful organisms. It is our duty to not only save the environment but also protect our four-footed companions from the toxicity of chemicals.